Wroclaw is predestined as place for this Symposium by its rich academic tradition for developments in Physics and Optics. In the 19th century Kirchhoff and Bunsen founded here a laboratory on spectroscopy later taken over by Lummer and Pringsheim who triggered the development of Quantum Physics with their measurements of blackbody radiation laws. Max Born, who was a student at the University of Wroclaw, worked temporarily in this laboratory after his PhD in Göttingen (1905), before turning to a career in Theoretical Physics and becoming the founding father of modern Quantum Mechanics (Nobel prize 1954) and author of the famous textbook „Principles of Optics”. This shall be reminded in a public lecture (Prof. Walter Dittrich) in the Oratorium Marianum of the University Main Building about “The Life and Work of Prominent Physicists at Breslau University until 1933”. This will be open also to the general public and serve as public outreach of our academic event. 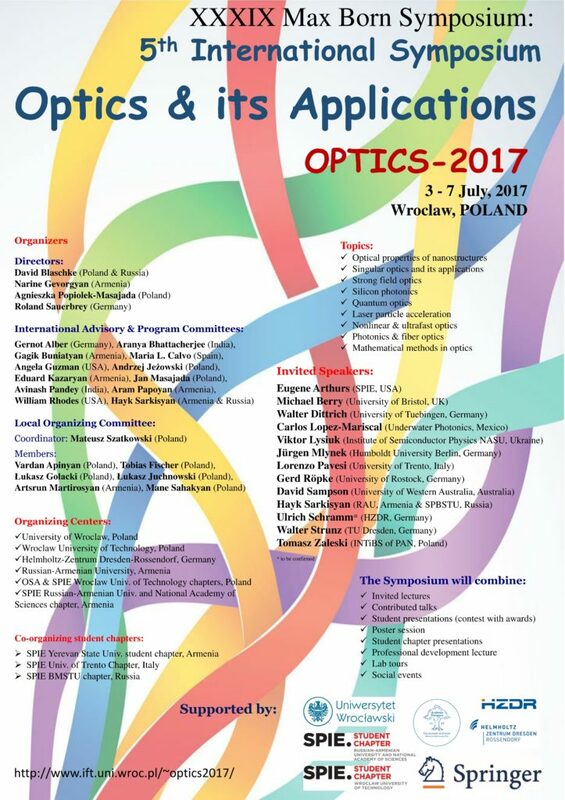 Different aspects of the broad spectrum of the present status of Optics and its Applications are selected and presented in invited lectures, contributed talks and posters. Highlights are the overview by the Director of SPIE, the Society for Optics & Photonics (Eugene Arthurs), the lectures on singular optics by Sir Michael Berry, and the outlook on “Frontiers for optics: the EU flagship project for quantum technologies” by Juergen Mlynek, the former president of the Helmholtz Association of German Research Centres. the Institute for Low-Temperature and Structure Research of the Polish Academy of Sciences (4 July). Young scientists and project leaders are in the focus of this event. They shall not only listen to excellent lecturers and have the chance to make personal contacts with them, but also present their own research in oral and poster contributions, the best of which shall be honored by book prizes sponsored by Springer. A special invited lecture is devoted to the professional development of young researchers. A unique feature of this year’s Symposium is that it is followed by the “Falling Walls Lab Wroclaw 2017”, a contest of wall-breaking ideas presented by young, bright minds in 3-minute flash talks. The jury selects a winner who will be delegated to the Falling Walls Conference in Berlin on 9th November 2017.